It has been a roller-coaster journey after the earthquake, and we are proud to have effectively collaborated with many local communities, young professionals, urban youth, policy makers and international groups in our post-earthquake activities — everything from immediate relief, to advocating for policy change and devising a long term Owner Driven Reconstruction program using locally available resources. The ABARI team would like to thank all our well-wishers for all the love and support this year. We are entering 2016 with even more enthusiasm to continue building contemporary and safe structures using local materials and vernacular architecture in conjunction with modern engineering techniques. ABARI designed and built a wattle and daub café in Pokhara. With elaborate bamboo joints and mud plaster work, the café defines beautiful vernacular architecture. Glacier Café is situated at Lakeside, Pokhara. ABARI has constructed furniture lamps, tables, chairs, and a chandelier made of bamboo for the hotel. Check out our furniture. Following the April 25 earthquake, ABARI with BELIEVERS initiated a very small campaign to provide relief materials in Gorkha, Kavre and Sindhupalchowk. The campaign quickly snowballed, and we managed to reach about 3000 families. In addition, we provided manuals for transitional shelter and transitional classroom. 1600 transitional shelters were built in Sindhupalchowk. ABARI designed 8 open source, modular permanent home designs for different economic, cultural and geographic brackets, with elaborate construction details. Our aim is to facilitate Owner Driven Reconstruction in earthquake affected villages. 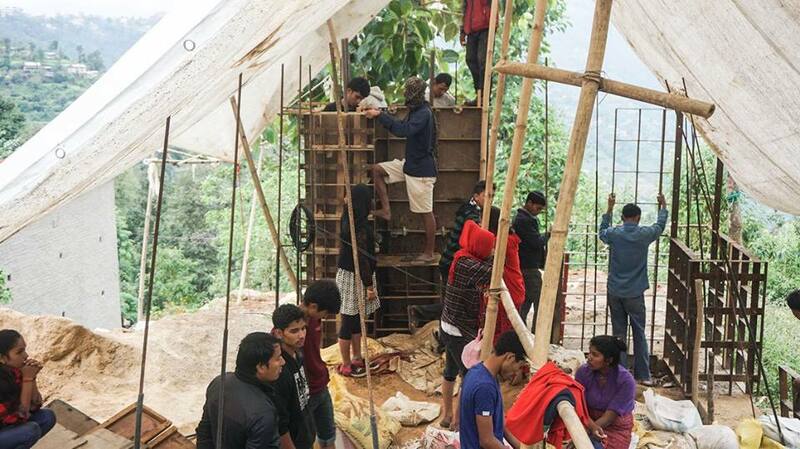 ABARI is building a rammed earth and wattle and daub house for Sanu Maya Tamang in Bhattedanda, Dhulikhel. Sanu Maya, an earthquake survivor, is a strong, independent woman and the principal bread-winner of her family. Her house is ABARI's first permanent reconstruction effort after the earthquake. Abari will be designing a farm center, 2 cottages and a training center for herb Nepal at their Ashapuri farm. In addition we are training locals on earthquake resilient construction technique to facilitate reconstruction. The Damauli project is one of the most amazing works done by ABARI. The owner of the house had collected some amount after working in the Middle East for 9 years. With his hard-earned money, he was really enthusiastic to build his house through ABARI technique. The house is situated at 5 Km from Damauli Bazaar. ABARI, in collaboration with WWF is planting bamboo in Madi municipality, Chitwan. ABARI aims at supporting and developing a bamboo model village in Madi valley as an approach to address the threats from flooding and also minimize human wildlife conflict in Chitwan. ABARI is building a two story bamboo café and meditation hall in Pharping. The structural frames are made of bamboo and the walls are built in modernized Barhaque techniques. The principal archive of books and periodicals in the Nepali language, was destroyed by the April 25 earthquake. 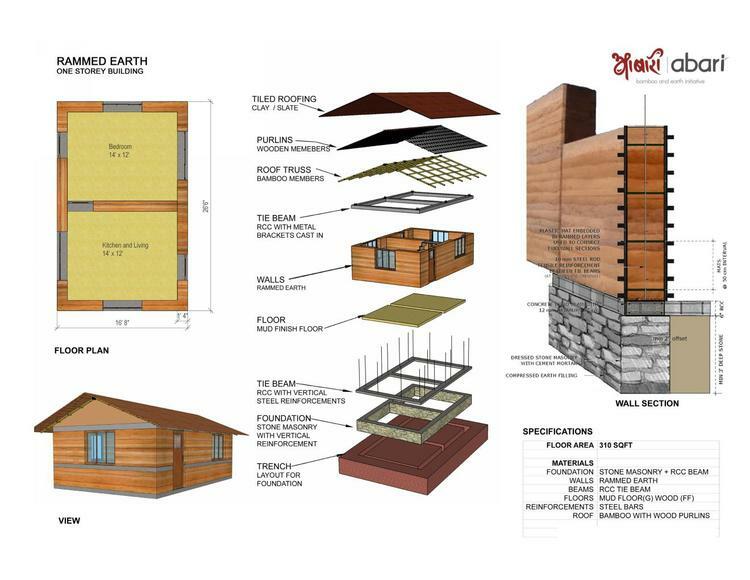 ABARI and the MPP have come together to rebuild a secure home for the national treasures using bamboo and rammed earth. In collaboration with local NGO, Sathsathai Mundi, ABARI is currently working on building a model village in the Timal region of Kavrepalanchowk District. The project covers an area of 7 Village Development Committees (VDCs). As part of the the Timal project, we are building a model school to replace the completely damaged Shree Narayansthan Higher Secondary School in Narayansthan VDC and a model house. Project Mero Gaun is an unique project conceived by Gyetrul Jigme Rinpoche with ABARI aimed at designing a model village that will serve as an example for post-earthquake reconstruction and sustainable development. The model village will celebrate the vernacular architectural tradition of Nepal by using sophisticated traditional knowledge of natural materials while incorporating contemporary design and engineering practices so that they are hazard resistant. Abari has been doing volunteer workshops since the past 5 months in the year of 2015. Our workshops has covered all our diverse technical and theoretical knowledge we use to design and build. Rammed Earth and Compressed Earth Block being the center of the focus till now. Our program aims to share our knowledge with everyone interested, from the layman to the highly skilled international and national engineering/architecture experts. In the end we hope to share, collaborate, educate and empower.